Since 2006 I have been living with POTS or more precisely Postural Orthostatic Tachycardia Syndrome (also known as PoTS – Postural Tachycardia Syndrome). It is a dysautonomia condition and it basically means that my autonomic nervous system (ANS) does not work, as it should. If you think about what your autonomic nervous system controls (or check out Wikipedia), you can maybe start to imagine how big an effect a malfunctioning system can have on an individual. POTS can therefore be a very debilitating condition that has a substantial impact on a person’s life every day. 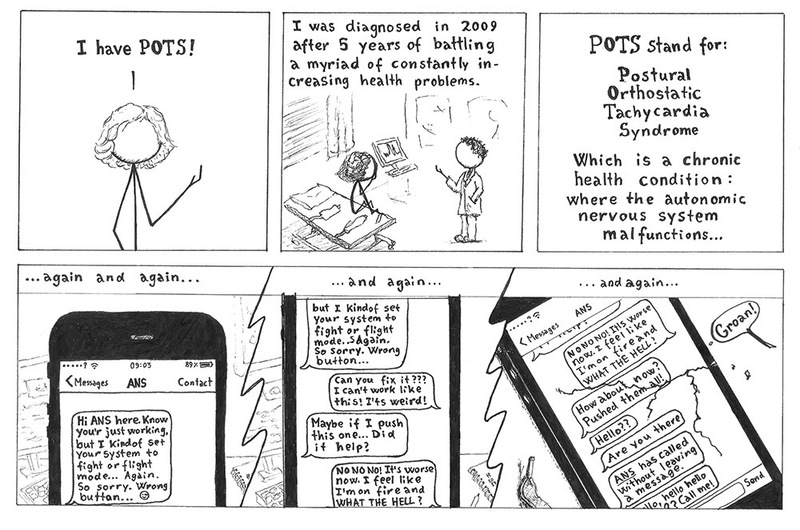 Unfortunately POTS is a very misunderstood condition. This is because many of the symptoms seem “ordinary” and because it isn’t a very visible disorder. Many of the symptoms are things that most people experience in their life – like headaches, dizziness and fatigue – but what most don’t understand is that it is not once in a while that these things are bothering people with POTS. No, POTS means that you feel like that ALL the time. While it is normal to feel fatigue sometimes, it is not normal to feel it every day and without anything to explain why. And POTS is one of these … well to be honest, I could not find a better word than “unfair” … yes, unfair conditions, where the person who’s life is a living hell because of the condition, does not look quite ill enough to be taken serious by the majority. Therefore POTS is one of those disorders that needs to get some more attention, so that people can get a greater understanding of what it is that’s happening in the life of someone with POTS. So if you know someone with POTS, I encourage you to really try to get to know what the health condition means, because the odds are that that person is feeling very misunderstood and alone. I myself has felt that way many times, and that is partly the reason why I have started to write about my experiences on this page. I have sometimes found comfort in reading or hearing about how others handle living with the disease, and I would like to give some of that back. On this page I will therefore write about my own life and experiences with POTS, in the hopes that it can help both the ones who suffers from the disease and their loved ones to get some help and support. I am not a doctor and I will therefore not try to explain the health condition in detail, for this you must go elsewhere (see links in “learn more about POTS”). But I will write about a lot of other stuff which have to do with living with the condition, like the emotional aspects, tips to getting better etc.